We are thinking about downsizing for a trip out west next fall so we are wanting to sell our 2016 Cedar Creek 36CKTS. This unit has been mostly defect free and being somewhat handy, I have fixed any issues we found or done the things we have added to this unit. 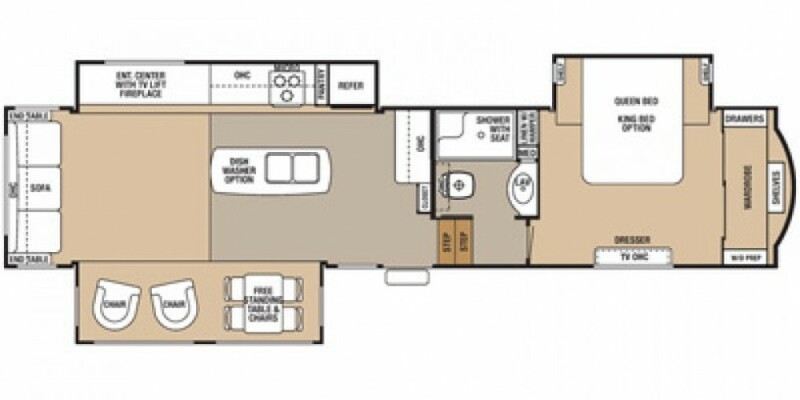 This unit has triple slides, the Cedar Creek 36CKTS Fifth Wheel by Forest River has spacious living space and accommodations for all the comforts of home and has plenty of storage space below. It won't be available until February 2019 since we have camping plans booked thru February. Two slide outs are located in the main living/kitchen area. When you enter to the left there is a slide out which has a free standing dinette with 2 chairs, and 2 auto recliner type theater seats with heat, massage and a center console I replaced the original 2 Lazyboy recliners . A comfortable sofa bed with end table at each end and overhead cabinets runs the width of the back wall. The other slide has an electric fireplace with a TV lift and three burner stove, overhead microwave, 20 CF residential refrigerator, and overhead cabinet storage. The kitchen has an island with a double ss kitchen sink. Up the steps towards the front of the fifth wheel the bathroom is on your left. It has a single vanity sink, a medicine cabinet, large shower with a seat, toilet and overhead cabinet. A night light is under the vanity. The front bedroom has a king bed slide out with a shelf on either side. There is also a linen area with 2 dirty clothes hampers, dresser and full width wardrobe with shelves and drawers for storage. A TV is wall mounted above the dresser. This unit has a 6 point hydraulic auto leveling system and I replaced the controller in October with a new control pad. I have the old one as a back up. I replaced the dealer installed 12 volt battery with 2 6 volt deep cycle golf cart style batteries to run the residential 20 CF refrigerator as we drive or lay over at a site seeing venue. It's nice to not worry about the freezer or stuff in the frig. The roof is in great shape. This unit has been stored in a covered barn and plugged in for climate control. The fiberglass front and rear caps are in great shape as well. I have replaced most of the window blind support brackets with 3 brackets if you have been keeping up with the breakage issues, spare brackets are available but hopefully no more problems. I've added a whole house water filter, a 2" hitch receiver for towing or a bike rack. 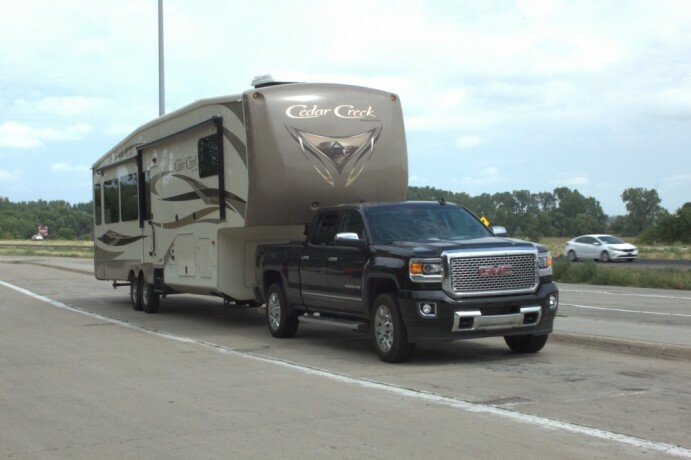 The 2015 GMC 2500 Denali Diesel Truck in the photo might be available for the right price but I plan on using it to tow a new smaller RV. It has about 40K miles on it and maintenance has been done at the dealership only. The tires are Westlake, in good shape and the spare has never been on the ground. 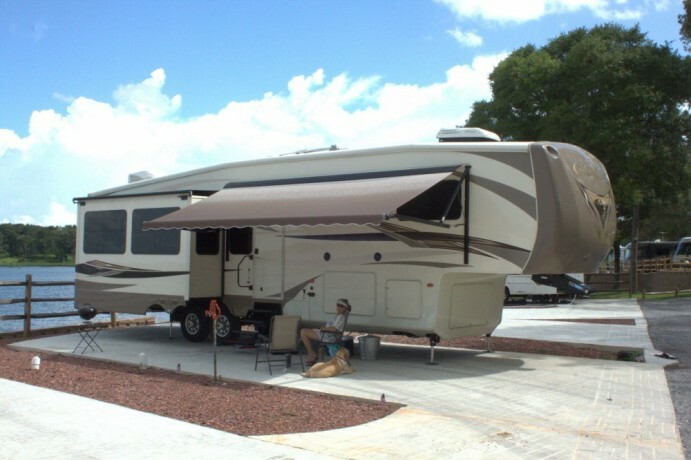 We have enjoyed this unit but a smaller RV probably is what we need to go out west from Florida to Washington state with stops in Yellowstone and Denver. We might consider a trade for something of equivalent value that meets our needs. Asking 51K for the 5th wheel, my research shows some units available in the mid 40's and some in the mid 60's so I'm splitting the difference based on the good condition of this unit. I will post additional photos if requested, let me know what you would like to see. The unit is located in Tallahassee, Fl.